Your First Choice in Last Resort Options! Relationship troubles? Annoying relatives? Problems at work? Take them to an ordinary advice columnist! For the really tough situations, ASK DR. ELDRITCH! Being menaced by the Undead? Scientific experiments gone horribly wrong and may destroy the Earth? A Loved One is possessed by Satan? Your gorgeous lover is using you as a patsy for an elaborate swindle? Don't fall victim to vampires! Don't get slashed by a psycho! Don't get stuck,ASK DR. ELDRITCH! Dr. Eldritch, I wander about on Halloween, handing out dental hygiene products, but I have no memories of anything else! Dr. Eldritch, Everyone says my destiny is to be the focal point of a great magical struggle, but I don't wish to do it any more! Dr. Eldritch, I accidentally sold myself into slavery! Please help me get out of this contract! Dr. Eldritch, A sailor told me right before he died that you might be able to help me get a new job. Mine is so boring! Dr. Eldritch, I'm in the sixth grade, and I haven't had a magical adventure yet! What's wrong with me? Dr. Eldritch, I'm writing not to ask for advice, but to offer my services. I communicate with dead people! Dr. Eldritch, I've been frightening sleeping children for centuries, but it's no fun anymore. Dr. Eldritch, My coworkers want to sacrifice me to a volcano because I'm a virgin! What can I do? Dr. Eldritch, Dangnabbit! What is wrong with superheroes these days? Dr. Eldritch, Are aliens are usin' our fields to send messages to each other for an invasion? Dr. Eldritch, Santa's disappeared! Christmas is in danger! Please help us! Dr. Eldritch, I'm a police detective. Well, I was before I reincarnated, now I'm a baby. It's terrible! Dr. Eldritch, I'm on the fast track to becoming the world's most feared supervillain, but I'm having problems with my girlfriend. Dr. Eldritch, Help! We're lost in the woods and something's trying to get us! Dr. Eldritch, I suspect my boyfriend has a secret life I don't know about, should I be worried? Dr. Eldritch, I be Xygothor, Chief Advisor to Phingasht, Supreme Ruler of Lapaeria, and soon to be emperor of your planet! Dr. Eldritch, My husband brought me back to life as a zombie, and now he's keeping me prisoner in our house! Dr. Eldritch, It is imperative that you assist us in selecting the proper prince for my daughter! Dr. Eldritch, Do you have any experience with controlling spectral intelligence agents? If we don't reacquire our assets, the terrorists may win. Sorry, letters prior to this date are no longer on the Web! 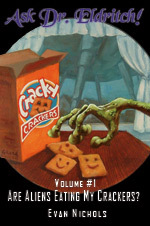 Many of the letters you missed about dealing with mysterious doubles, undead, alternate dimensions and much more, have been published in "Ask Dr. Elditch Volume #1 Are Aliens Eating My Crackers?" Get your personally signed copies for just $15.99 per copy, and that includes priority shipping and Bonus Gifts! Click the "Buy Now" button for easy ordering! Want to try before you buy? Download the FREE eBook from Lulu.com!